I struck Food For Friends off my Christmas card list years ago after one too many meals of dreary, greasy tofu stir-frys and deep fried everythings. It was the place I endured rather than enjoyed when my vegetarian or vegan friends wanted to eat out. 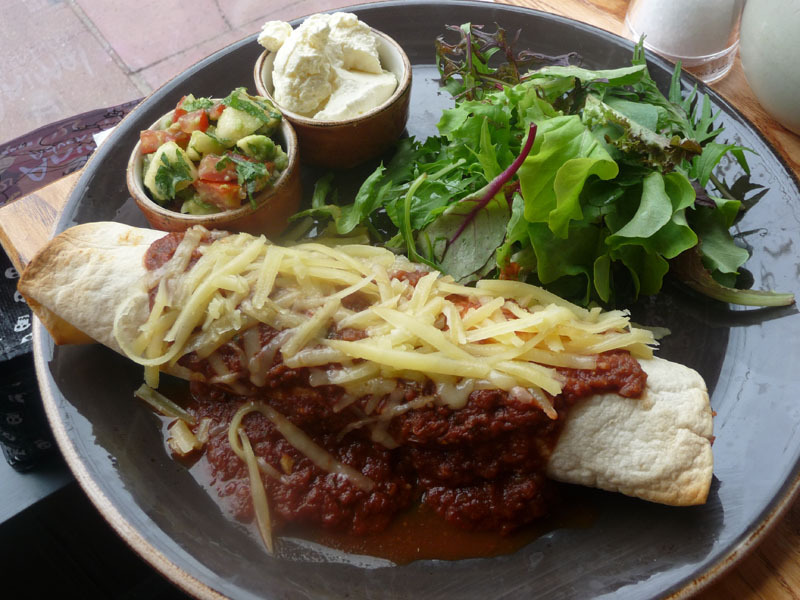 Back then fully vegetarian restaurants were a rarity, even in Brighton, and having been here since 1981 it was the casual go-to for those that are adverse to flesh on their plate. The design face lift FFF had a while back reignited my interest in the place and recently I've been walking passed the perfect footfall location and inviting facade but still sniggered at the "Best Brighton Restaurant" award advertised on the chalkboard. And I'll be honest, it took an invitation to review to get me back in those doors but by heck I'm glad I took them up on it. Everything has been elevated. The brand, menu, quality of the food, presentation, service and interior. This is almost a different place entirely. Smarter and sexier, it doesn't seem to be compensating for anything any more. I'm guessing the new-ish head chef is directing the food into more inspirational and aspirational arena and the new owners since 2004 have clearly worked magic. More of the food is made from scratch including the bread and icecreams and it shows. Practically entirely devoid my pet hate of tofu (or any other weird soya processed stuff), the menu made choosing hard as most dishes read well. 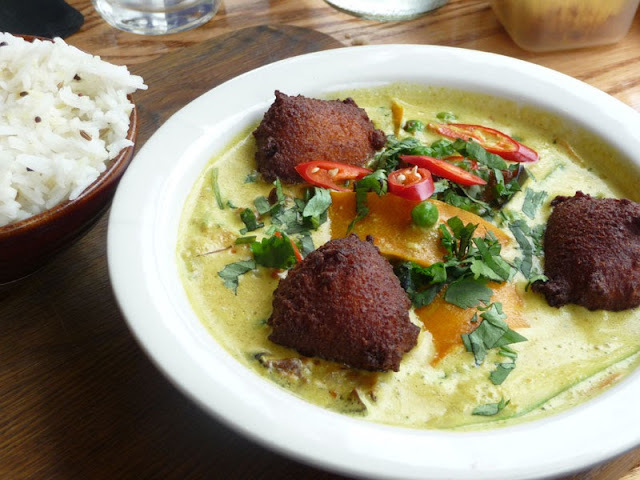 Finally I opted for the Malaysian coconut curry, mainly for the chickpea dumplings. This colourful dish was a treat on the eye and pleasing texturally. The vibrant vegetables were kept as al-dente ribbons and along with the dumplings made it interesting to eat from start to finish. I loved the aromatic rice served with it. My friend's mixed bean, sweet potato and basmati enchilada had a really good hit of spice. The many components kept it fun and was the perfect choice for lunch. The side order of chips were not needed. They were probably the biggest chips in Brighton, possibly Sussex, and the truffled mayo was a nice touch. It was a shame we were to full to really appreciate them really. Miraculously space was made for dessert (isn't it always) and glad we did as they were stand out. Just look at them! My coconut and black sesame ‘arancini’ was something different and I'll even forgive them the use of slate here (whyyyy?) as I really enjoyed it. The arancini were soft and packed with coarsely grated coconut. 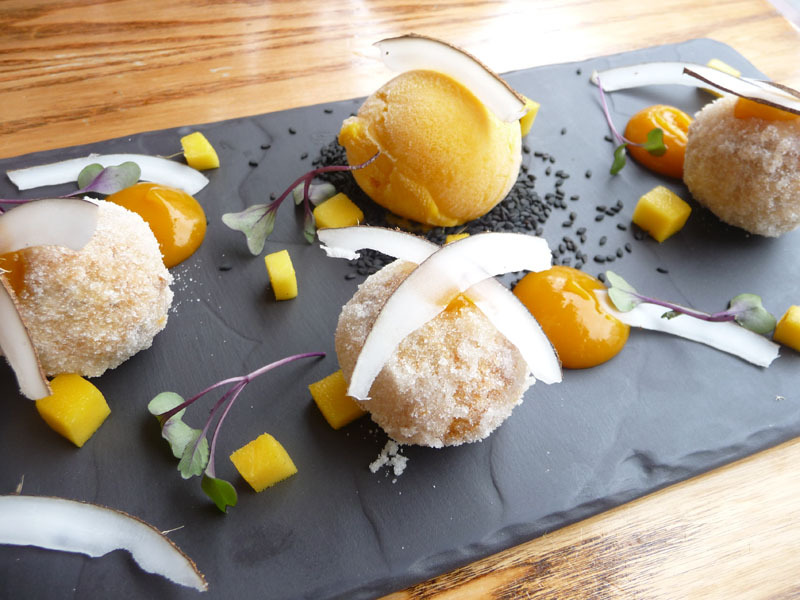 The donut-esque sugar coating gave them a sweet hit and they worked perfectly with the mango pieces, sorbet and gel which lightened and freshened a potentially heavy dish. 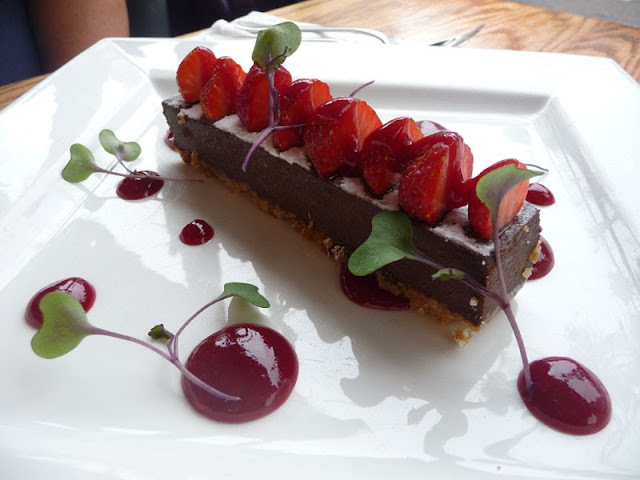 The dark chocolate truffle torte was lip smackingly rich. I would have liked the base a little crunchier but aside from that, I thought it was a pretty good torte and I'm not much of a chocaholic. I can't believe I'm going to mention the tap water but the slither of cucumber was something I haven't seen before and highlights the attention to detail at work here. Will be nicking that idea. Clearly having had an episode of madness, I had brought along my 19 month old toddler and my friend did the same with her boy. I wouldn't say this was an ideal spot for such small toddlers, despite being so well accommodated by the friendly staff. Quite a lot of the diners seem to be of the old school "right on Brightons" and we did get a few looks, one table even moved upon seeing us, which I don't blame them at all. Before having the kid I thought under 16s should be banished from all restaurants. I was disappointed though to see that the children's menu is rather uninspired and doesn't reflect the quality of the standard menu. (This apparently is due to change thankfully.) It currently offers just pasta, hummus and pitta or pizza (which Baby Foodie refused to eat - his Italian genes rejects half-hearted pizza bases). Older kids will be fine at FFF as they should be happy to order from the standard menu. You can't appease all sections of society and nor should anyone have to. Instead I think Food For Friends is perfect for smart, lingering lunches (or afternoon tea) with friends and I am actually really keen to come back for dinner on date night with Mr GF as I think the atmosphere will be fantastic after dark. The evening menu is more extensive and whether you have dietary requirements (gluten, dairy intolerant, vegan, vegetarian, religion catered for) or not, I'm sure you'll have a wonderfully memorable meal here. Meat will not be missed at all, trust me, and only narrow minded palettes will struggle. I would say that the pricing is right and presents decent value for money. Portions are generous and robust yet elegant with it. Service here is perfect. Professional, smart, friendly. They tick all the boxes and can't fault them on anything. I was even shocked that the lady looking after us had only been there a few weeks as she was so knowledgeable about the menu and brand in general that I assumed she was well part of the furniture. 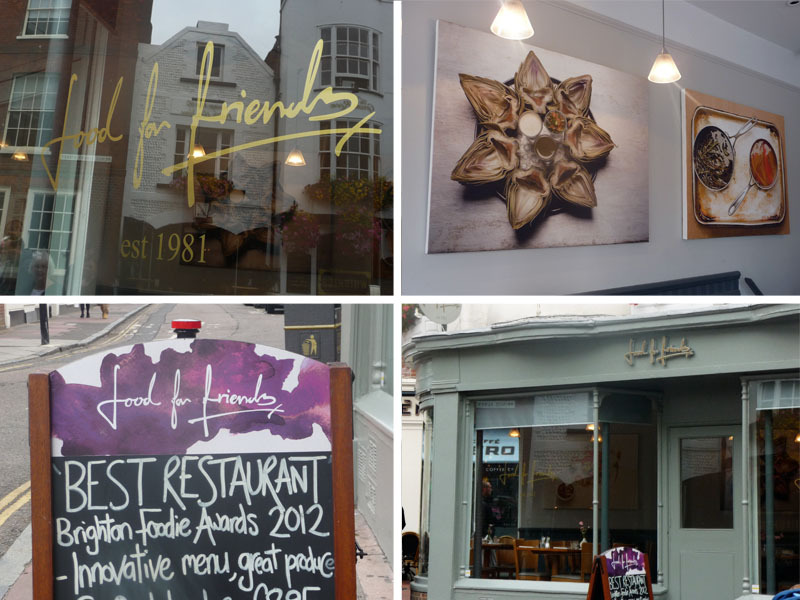 In my opinion, even despite a very good meal, the title of "Best Brighton Restaurant" is pushing it a bit, especially with some of the places I've eaten at recently still fresh in my mind. But it certainly deserves to be up there in the top 10. Try it, especially if you haven't been back for a while as I'm certain you will be pleasantly surprised.